Designing and building this room over the past 6 weeks with Chris has been a lot of hard work and late nights but most of all, a complete pleasure and an experience we’ll remember forever. 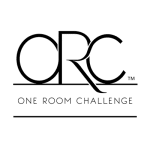 But even before Linda asked us to be a part of the One Room Challenge (we’re so grateful! ), we thought about creating a shared room for our girls one day. Truthfully, we’ve been dreaming about this room for 6 years. The 4 years we struggled with secondary infertility, I wondered if Greta would ever get the chance to share a room with a sibling like I did with my sisters growing up. And when Faye was born, she asked the first week if they could share a room, and I said, “One day.” And now, 2.5 more years later, that day is today. And that room is this room. We used the room for the past couple years as a guest room. In the other direction, the 9×12 room had a wall of closets that we tore out in favor of built-in Ikea PAX closets in week 4 of the ORC, one for each girl. To the right of the bunkbeds, nestled in next to the window, we had just enough room for a reading nook. It actually started as a solution to combat the bunkbeds intersecting the window if they were built up to the frame, but now we can’t imagine the room without this sweet nook. Since most of the walls were filled with bunkbeds, wallpaper (that wallpaper! <3) or wardrobes, we were able to keep the art minimal but impactful. I commissioned my sister (her Etsy shop is here!) 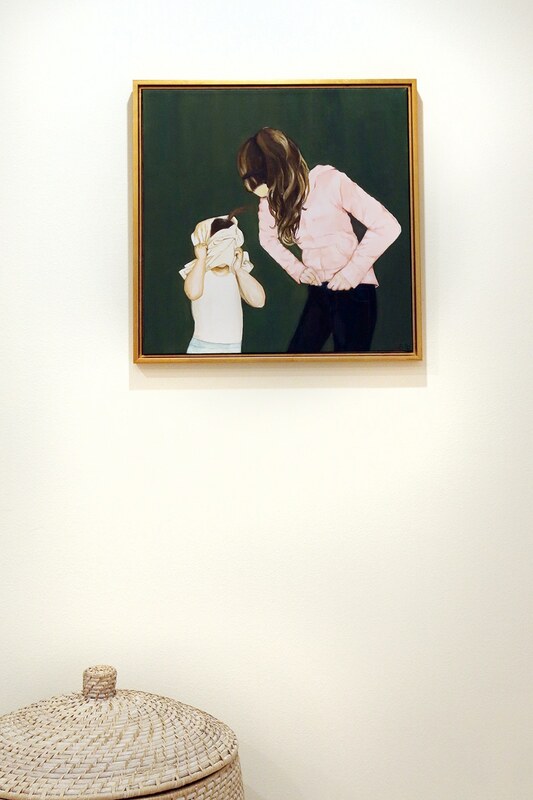 to do a painting of two little girls (that look strikingly similar to ours) getting dressed. I couldn’t hold back the tears when it arrived framed in Framebridge’s Valencia floating frame. On the wall behind the door, I hung two prints that lived in Greta’s old room that are still favorites. The former room lacked light, so we replaced the singular overhead light with 9 lights scattered throughout the room to maximize brightness (and Chris put them all on a dimmer switch, too) and we replaced this rarely used room in our home with one that brings our girls (and us) so much happiness. To say they love it is probably an understatement, but it’s also the only thing that matters. It was emotional seeing their faces see their room for the first time. And although it will probably be a few more weeks until Faye is completely transitioned to this room (she’s still sleeping in her crib),we’re so excited to watch them grow up together in here. (Now we just need more kids so we can keep on designing kids’ rooms–I’m convinced there’s nothing more fun!) 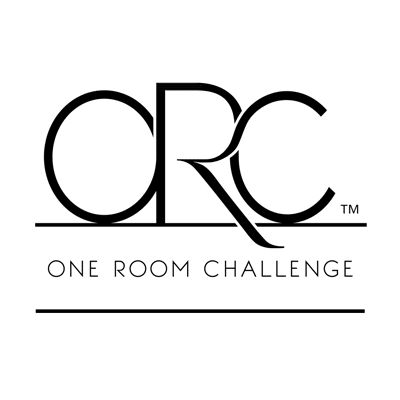 I know this is the 6th and final official week of the One Room Challenge, we still have so much to talk about. So we’ll likely spill more details about challenges, design decisions, and answer any questions you may have in the coming weeks. 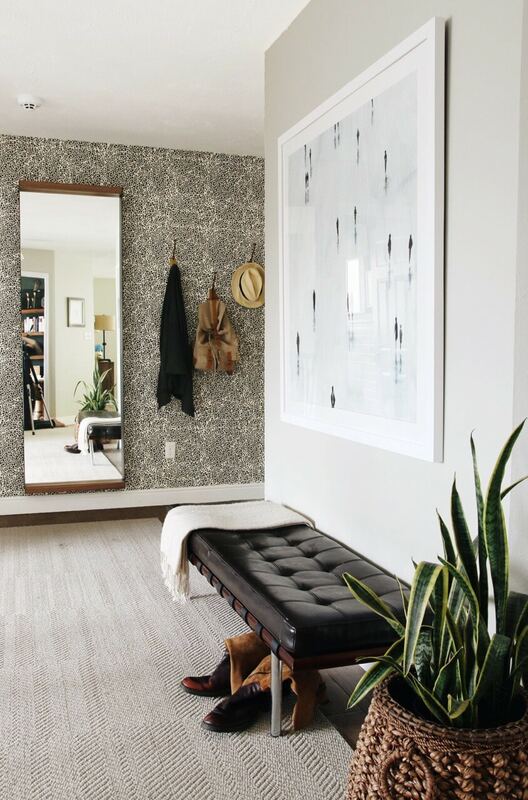 See how the other One Room Challenge Participants finished their spaces in the links below! 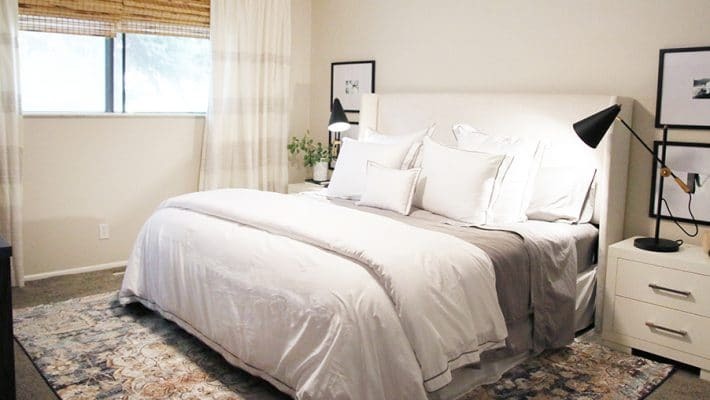 Before and After: A One Day Master Bedroom Makeover and 5 Tips To Transform Your Own! Hi Chris & Julia! Big fan here, but my first comment : ). So we are building these bunk beds for my 2 youngest daughters currently (we have 3 girls too!) and the only question I have is regarding the depth of those 2 face pieces that cover the sides of the mattresses. I guess I’m trying to understand that & what your reveal is for the mattresses, I understand your mattresses are 10″ deep, curious how much of that 10″ sticks out if that makes sense. Thank you in advance & Happy Holidays! Facing pieces are about 10in tall, giving a 4in reveal of the mattress. Oh wow – this came out so beautifully. I like everything about it! I have a question. On the top shelf of th ebook nook, there is a box/book (?) titled “15 magic tricks” and I was wondering if you cold share where that is from? My little one is all into magic these days and I think that be fun for her (and it looks great too). I believe we found that at TJ Maxx. Question, I realize it’s been awhile since you used these sources. Is there any chance you know the name of the mirror featured, it is no longer on the rejuvenation site and I wonder if it’s anywhere else out there. Thank you! I feel like I saw a similar one on Target’s site–not sure of the name though. Absolutely adorable! Not sure if I missed it but did you guys have box springs for the beds? wonderful style! You thought of every detail. Whether it be artwork, wallpaper, or simply the lights everything is thoughtfully constructed and unique. So you have really made a balanced decision. I’m currently decorating a room for my two girls to share. You have given me encouragement and inspiration! Here’s a new twist on bunk beds: Rather than having both beds point the same direction, place them perpendicular to one another. Coordinating bedding lets each child express his or her personal style. A black modular unit and cubbies above each bed provide ample storage space. Bedding, furniture, and toys in a bold orange color palette create a fun atmosphere. We are installing PAX wardrobes in our master because closet space is lacking. Ours will flank a window but one side is 5 inches longer than the other. Any thoughts on how to make it look better/symetrical? Maybe just space them evenly? We are having very similar bunk beds built for our cottage- thank you for the inspiration! 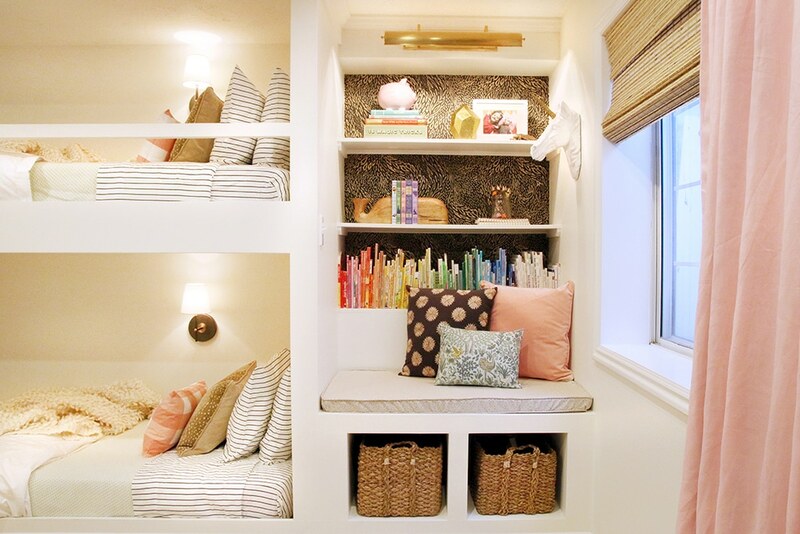 Would you be willing to share the measurements for the items (stairs, bunks, sitting area) along the bunk wall? I was wondering if you could tell me a little about the lighting in the room. I’m currently decorating a room for my two girls to share and I absolutely love the star shaped flush mount. My question is, how bright is it? You have a lot of lighting in the room but I only plan on having the one light. Is it bright enough to splurge on, because I love it but if it doesn’t brighten the room enough then it won’t be worth it for me. Also, do you know of any similar designs for less? This is absolutely darling and sophisticated! I am new to the blog and so very inspired by all of your work♥ One thought I had (although I’m hesitant to say it because if you wanted it, you would have done it and we know you are gifted:) but perhaps you take the black paint on the PAX and paint the base and crown above the bed? You could continue the small black molding you added around the PAX at the ceiling. That would really make the 2 sides of the room cohesive and tie in the black a bit more. Just some ideas I had. I’m so excited to keep digging into the rest of your beautiful work! Love this whole room! We are currently building a bench nook in our nursery right now. I was just wondering where you got your cushion for the bench. I’m guessing it’s custom? Would you mind sharing the source of where you got it? It’s custom. A friend of ours sewed it for us using the fabric we gave her. Love, love, love your girls’ room! So sweet, but not too girly. I tend toward more masculine finishes and decor, so it’s nice to see a girly room that’s not overly, well, girly! PS: If they’re a sponsor, sorry I missed that, and good for you for having such great content to attract sponsors! What an absolutely stunning room!! Any girls dream! It doesn’t even look like the same home! 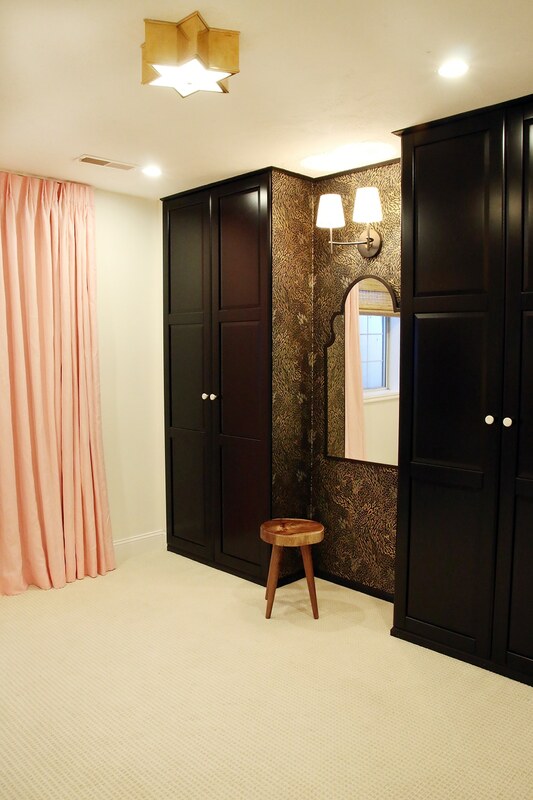 I love what you did with the closet and the touches of pink are the perfect soft touch. Congrats on this gorgeous reveal! 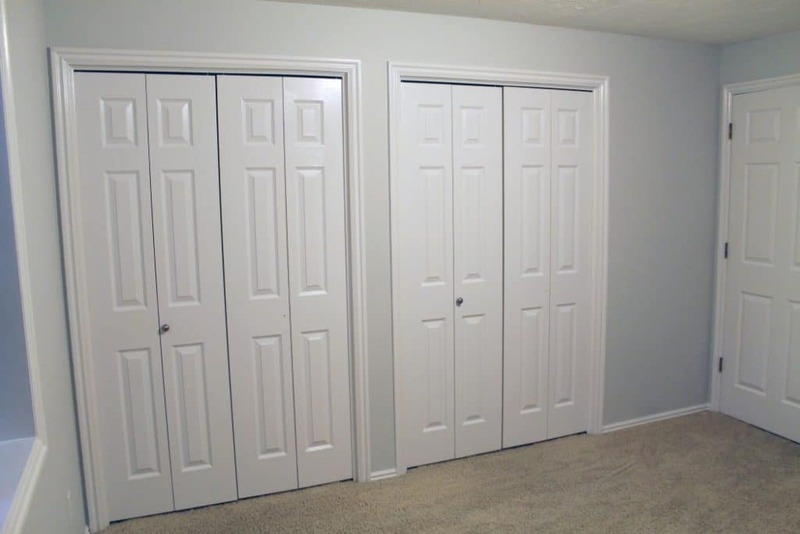 Quick question: when you say the room was 9×12 – was that including the depth of the former “walk-in closet” or was that space in addition to the 12ft? The 12 is actually from the door to the window. The 9 is from the back of the bunkbeds to the front of the wardrobes, or former closets. They are nearly 2 ft deep. Wow. What a beautiful room! Do you happen to remember the name or style of the curtain rod you used? The link goes to the website but not to the curtain rod. I just love how minimal it appears in your reveal room! I have two daughter that share a room and are older so they have homework. 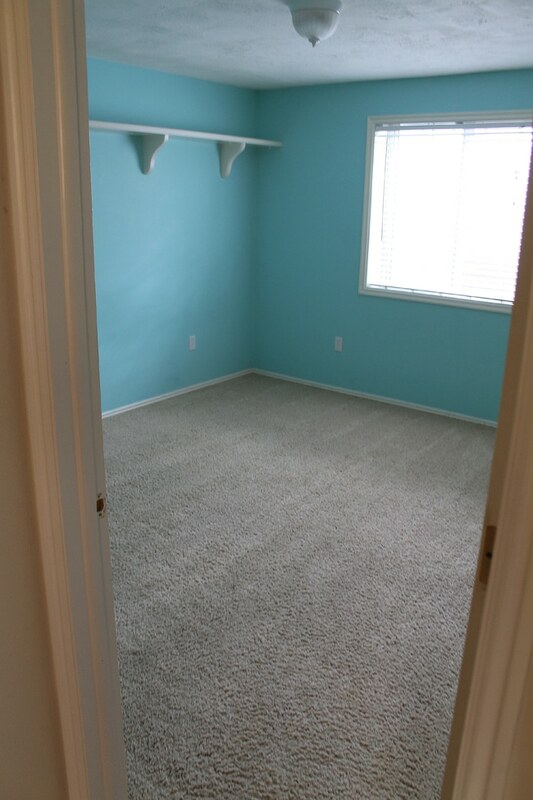 We have two closets with a space in the middle like in your room but we added a built in desk for homework in the center. You may come to this point. I do think this room needs a darker floor. or a carpet border around the edge or wood. But honestly it’s only my personal taste that I like a constraint between the wall and floor. I love it! My favorite part besides all the build-ins has to be the pop of that pretty pastel pink that feminizes the whole space. Great job! The build in bunk bed is fantastic! But I’m a worrier, so one thing that concerns me is the spacing of that rail in the top bunk. I had a friend whose daughter almost died when her little body slipped through a gap between the mattress like that and was hanging by her head with her face smashed against the mattress. The only thing that saved her was her mother’s intuition to go check on her in the middle of the night. I wonder if adding another rail a little lower would negate that chance? Sorry to turn a positive comment negative because I love your design! I just had to mention it in good conscience. I love reading your blog, keep up the good work! Love your blog and your style! I just created a nursery for our very long awaited first child (little baby girl just turned 3 weeks old!) and always thought of decorating her nursery like a teenager – a little grown up, a dash of whimsy! I love this room! I wonder if you can share more about the books between the whale bookends? Such a darling space for your special girls, thank you for sharing it with us!! Beautiful job!! Question, so what do you recommend when you have a small room like this and no playroom in the house for all the kids toys. I try to hide stuff in their closets but they are also small closets and its not like they have tons of toys. Any suggestions? Thank you. It is so special! It looks like a normal room in the before–but you guys made it magical. They’re going to love it for a long time! I think this space looks especially wonderful because it’s cohesive with the rest of your home. 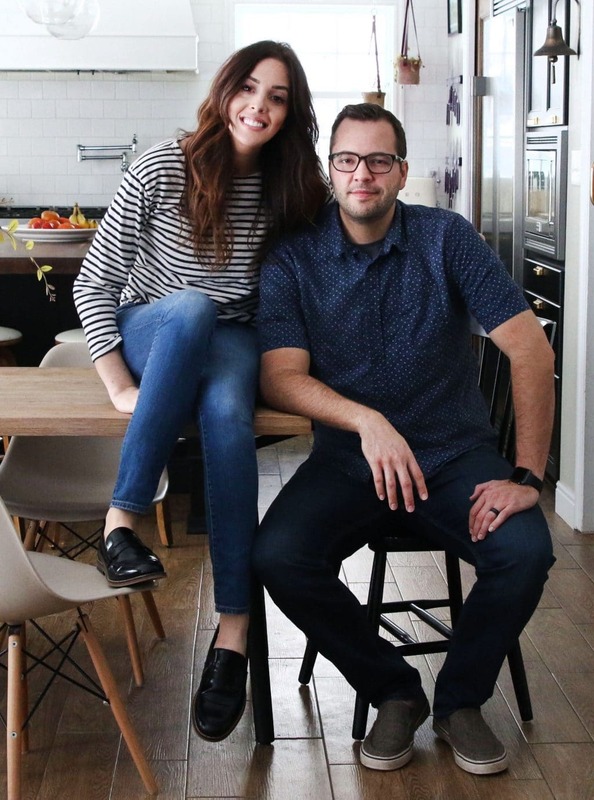 You did an amazing job of choosing styles and items that work well for your family and home. Beautiful space! and agree on the dark colours not being just ‘adult’ (our baby’s nursery is hague blue from Farrow and Ball). Oh! glad you’re going to follow up with questions, because I still want to know how you got those PAX up and installed. I’ve had them before, but in a 10ft ceiling room of an older home. But I love their versatility and want them again and have 8ft ceiliings in this house. Love these sweet bunks, and especially the bedding! what lucky girls! This is so special. I loved sharing a room with my sister growing up! Gorgeous room! I love how you thought of every detail. Your choice of pattern in the wallpaper, fabrics, and bedding are amazing. 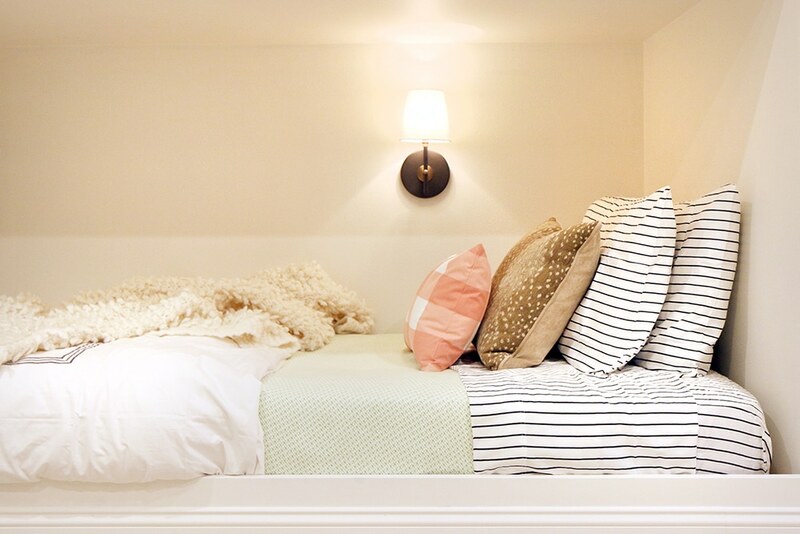 Absolutely gorgeous transformation for a shared girls room! Congratulations on a job well done for the ORC! While I like both sides of this room, they are so different that they don’t even look like they are part of the same room. Super dark and moody/glam on one side, and light and cheery on the other. This is exactly my same thought. Even though there is a bit of the wallpaper in the nook, they don’t blend. Perhaps if the wallpaper were on the walls within the bed as well? Agreed. Maybe wallpapering the whole opposite wall would help balance it out and join it together. It also doesn’t look like children live in it. 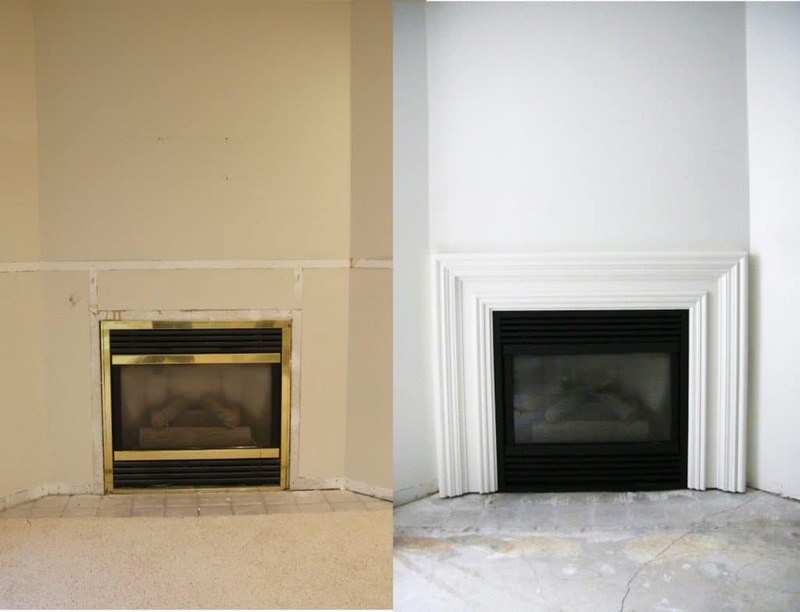 Amazing transformation, would love for my rooms to look like this! Great work. I am so curious about the lights… are they all linked or on different switches? Where are the switches? It absolutely amazing! You both did an amazing job…. it must feel so so good to have it complete! it’s perfectly sweet and beautiful! and i have those same West Elm sconces that I installed above our fireplace last year and I still swoon every time I walk by them. SO good and surprisingly inexpensive! 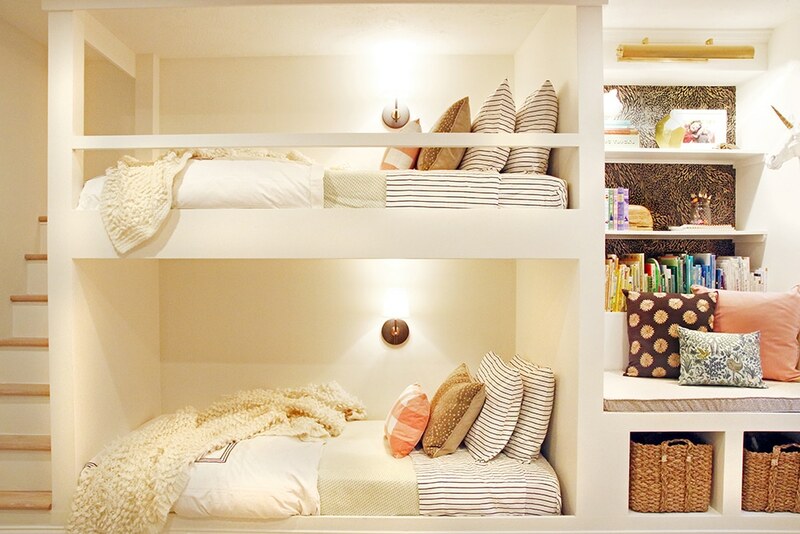 Built in bunks AND closets like that were genius! This is such a special space for them! I’m just wondering whether there is enough space between the two pax closets for another one? When the girls are older they will need a taller hanging space for dresses and coats. I love this! And what a great idea for a family with more kids than bedrooms (like mine). What are the actual dimensions of the room? I would like to know if this is something I could do in my own apartment! What a beautiful and functional kid’s room. I’m impressed that it only took you six weeks. Can’t wait to see what you do next! So sweet that your girls will grow up there together. Great job! Beautiful room. And the fawn pillows are to die for….but honestly way too pricey for me to buy for my girls rooms…$400+ for the pair….wow. I linked to a similar, more affordable one on Etsy! Chairish is one of the One Room Challenge sponsors, and they provided a $250 credit to their site–still a splurge. But the cutest splurge! Amazing Job Julia and Chris!!!! So much inspiration in this room! I absolutely love the way this came out! I’ve been following along and could not wait for reveal day, for your space in particular! I am an avid listener of your podcast as well.. I’m not sure if this room falls into the “clean” or the “chic” category – but I’m sure Chris and Preston have some ridiculous opinion ;) I love the wallpaper and the mirror as a little dressing area – we were thinking of doing something similar inside our master closet. So well done! You guys never cease to amaze! What a beautiful space. I love the little sconces in each bunk and those antelope pillows are to die for. It’s beyond perfect!!! every detail is so well thought out, bravo for chris building the bunks (so impressed!). And all the positive thoughts as Faye transitions! She will do well, promise! This is STUNNING! And I love all of the floor space for play! What was donated for this room? I’m curious about what you were gifted and what you had to pay for as well. The room is beautiful but there are some very pricey pieces. It’s always so wonderful to gain inspiration from blogs but its seems lately a lot of posts are sponsored in some way and include many high priced items. I saw a lot of things in your girls’ beautiful room that would be nice to bring into my own toddlers’ shared room but to the tune of almost $3000 (and thats just some of the bedding, a couple pillows and a light or two in your room!!! ), thats not happening. It’s disappointing. Any time I click on an item in you house from recent posts and they come with a higher than average price I immediately assume they’ve been gifted to you. I know this has been a reoccurring theme, but I really do think transparency is so important and the blanket statement of “___________ sponsored this post” does not state what you actually had to pay for and its also casts doubt on whether you’d actually pay that if you had to. Everyone is different but I am designing my 3 yr old twins room and because they are 3 I am doing it on a budget, one that would not include $430 throw pillows. Have you listened to their podcast? There are at least 3 episodes around budget decorating and things you can do to your house for little to no money. There’s also an episode about blogging and affiliates and how they’re compensated for things and how that doesn’t effect their choices. Julia even says she was complemented by one of their sponsors for choosing more moderately priced items. I’d recommend listening to episodes 6, 9, 10, 17, 19, 22. I know it won’t answer your questions about this specific room but it may clear up a few things for you. They are incredibly transparent about these things on the podcast. CLJ: I am speaking from memory here. Hopefully all that I’ve said here seems accurate. This is lovely! I also have two little girls who share a room, it is so special for them. You guys did a great job! It is absolutely GORGEOUS!! What are you going to do with the furnishings in Greta and Faye’s old rooms? I love the bunkbeds! hopefully you can find more XL Twin sheets as time goes on. could you share what lens for your camera you use to photograph most of your rooms? I’ve been searching and super curious what you guys use! Love it! You did a wonderful job – those are lucky girls! I was actually so worried about that wallpaper – I thought it was so dark and harsh for a little girls room but I love it!! Such a beautiful room! Love the built-in bunk beds, stairs and that cozy reading nook! I also love the combination of textiles. Great job, you guys! Lucky girls! Makes me wanna be a little girl again! 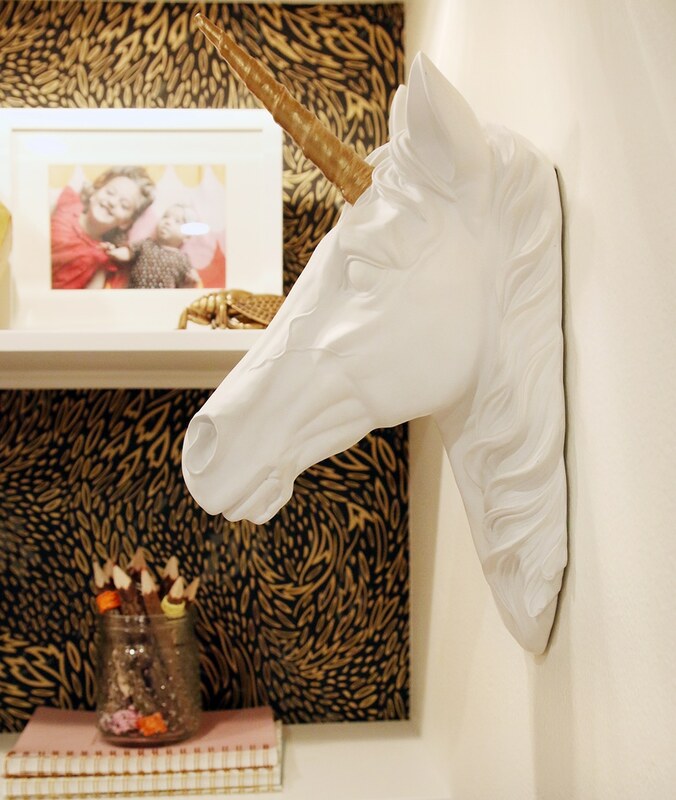 Love childhood glam feel and definitely still such a fun space for you girls! Congrats for a fabulous job! the girls must be so very happy! hard to accomplish, but you did so just perfect!! Love this design? Wow! Everything you two touch is just magic! This room is unbelievable. I loved the mood boards and everything from the beginning but had a hard time totally envisioning how it would go. It did not disappoint! And girl, your photos are AH-MAZING! Amazing job you guys. That wallpaper is by far my favourite element in the space, but there is truly so much to love! It feels fresh and feminine but quirky and witty at the same time. Fabulous job! Such a perfect space and your girls must be in heaven! Especially love the use of space for the bunks and your sister’s art. Fantastic Job! Wow this is so adorable and so much lighter and airy than I would have guessed given the sneak peeks you gave! 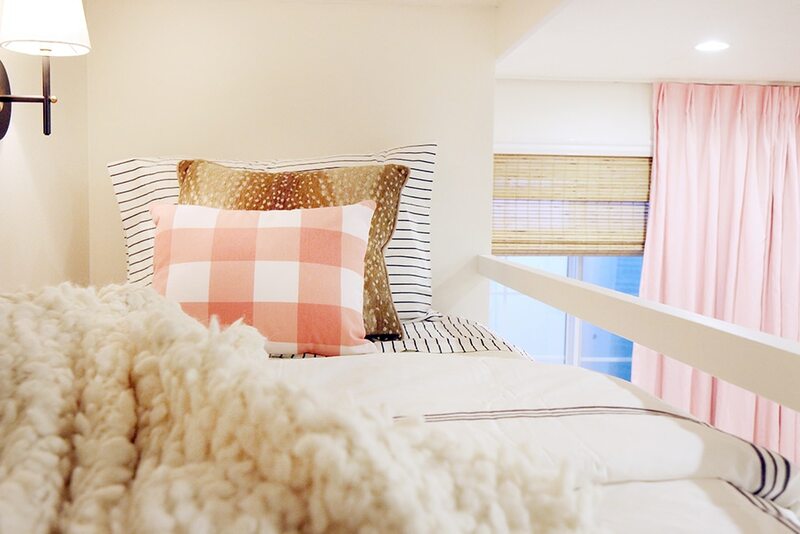 One detail I’ve always loved since spying it on Sarah Sherman’s blog is curtains on these types of bunkbeds – I thought for sure you’d do the same but in a small room maybe it wouldn’t work or not right for your girls. We are transitioning our little babe from his crib to a low platform framed house bed we built (He just turned one) as soon as the stain off gasses. I would love to hear an update on how your transition went and if you have any tips! This room is just too sweet, awesome job! Look forward to hearing more of the details in the coming weeks. It is such a beautiful room :) Do you think it seems like you should carry a bit more of the wallpaper on the left side of the room? We like it as is (and have a whole roll left) but everyone would put this room together differently, I’m sure! Was thinking the same thing! That it should go behind the bunks too- feels so white in that one area of the room. I love the room completely but have some very serious concerns about the top bunk safety rail. The space between the rail and the mattress is wide enough that a child, especially a small one, to slip through, and perhaps even get stuck and hung by the head or another body part. I’d absolutely encourage researching rails and figure out a better way to configure it without the spacing between the mattress. Beyond that one concern it’s simply lovely. I thought the same thing. It just looks a little kid may be able to slide though there. Other than that the room is beautiful! Hi, when I clicked on the whale bookends for the source, it links to the hamper. Can you fix? Thanks! Room is gorge. Such a sweet room! You guys accomplished so much in those 6 weeks – a job well done! Jaw on the floor. It’s unreal! The pictures are gorgeous and magazine worthy. I’m obsessed with the heavy pink drapes and the lighting fixture! I’m just a bag of swooooooon over here! There are so many things to love, but the way you left the stair treads natural plays so nicely with the brass accents in the room. Also, THAT PAINTING. (Also? You guys built all of that! In 6 weeks!) I’m feeling so inspired right now. WOW! My jaw is on the floor!!!!!!! I LOVE how it looks like a precious and sweet little girls room, but yet sophisticated enough to be a room for ANY age!!!!!!! It is perfection!!!!!! Bravo! Wow. I am just blown away by this beautiful room… although not surprised because CLJ and beautiful spaces just go hand-in-hand. I hope you all are able to enjoy some well deserved relaxation!!! :-) and your podcast… my favorite thing ever! This is STUNNING! I audibly gasped (all alone in my office) when I saw the first photo. What an absolutely beautiful, beautiful room. Oh my word! That is amazing, beautiful, creative, and fun all wrapped into one. I’m just visiting from the ORC and your space totally takes the cake! Wow. Just wow! Absolutely gorgeous! I love everything. There’s a lot of ugliness going around today as well in the world and I am so delighted by the distraction of the challenge! Perfect timing :) Perfect, perfect room! Wow every detail is spectacular! Obsessed with the bunk bed & your sister’s artwork is so sweet! I want to be a kid again just so I can live in this room. It’s magical!! So beautiful! Great job! 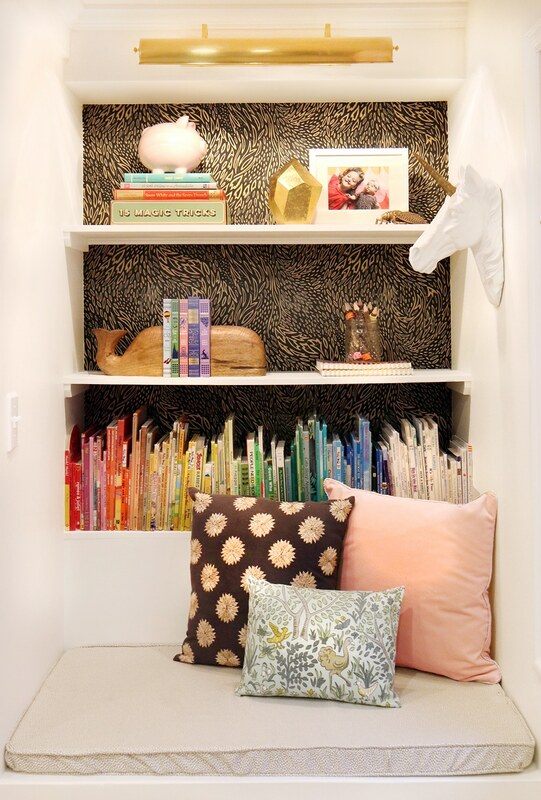 That little nook between the wardrobes- so perfect for dress up! Your creativity and designs are so inspiring! Every detail is perfect. 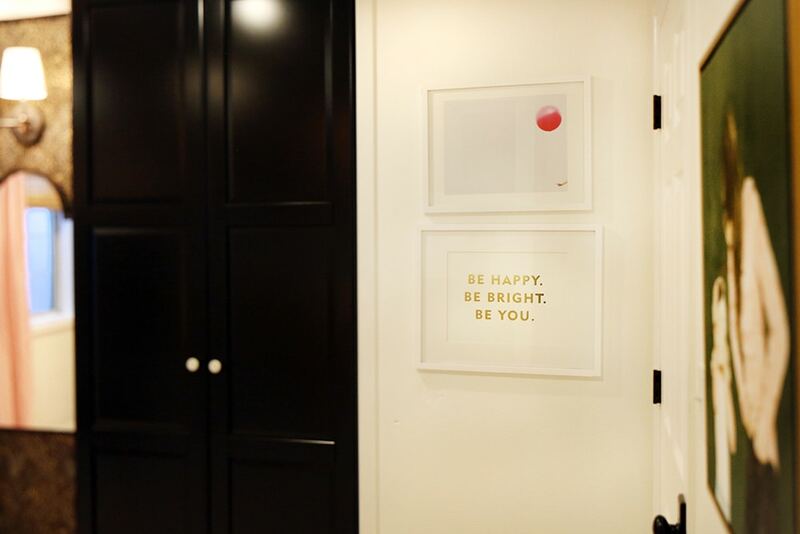 I love how you have created a room that fits your girls and the overall design of your house. Sophisticated, yet playful. This room is stunning!!! 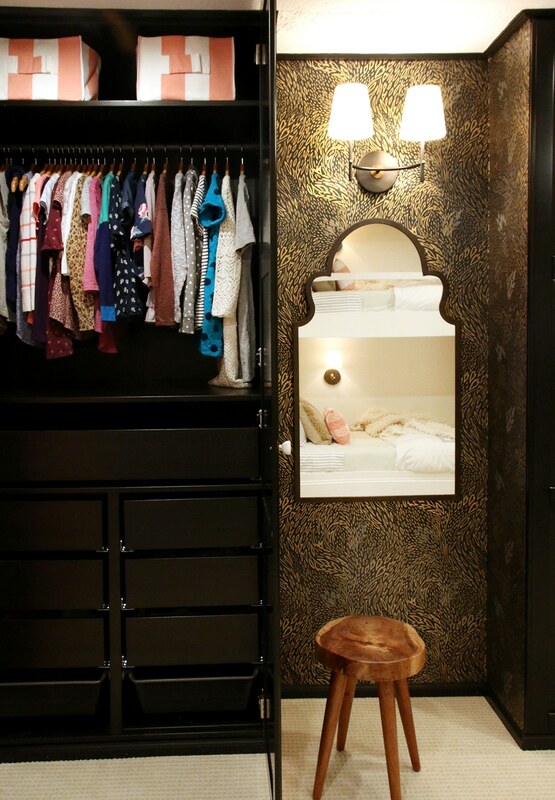 I`m in love with your design work, especially this girls`room! The contrast is just right and I cannot tell how much I admire this painting (! ), the reading nook and light fixtures. Is the mirror the one from your upstairs bathroom and did you find time to address the window wells as well? The mirror IS from our upstairs bathroom, good eye! The mirror we ordered for the room got damaged in shipping and we watched it stop and return to the sender on the tracking. It was a dramatic event. Haha. But this one works so well in here, I’m not even mad about it. We didn’t have time to address the window wells, but we’d still love down the road! This is just darling! What a perfectly glamorous and girly space. How beautiful! What a wonderful, lovely gift to your girls. I love it. So much inspiration for my two little girls’ shared bedroom. It’s delightful! CONGRATULATIONS! This is SO beautiful! I can’t believe you did this in that short amount of time. What an amazing space for two young girls! I love the contrast of the wardrobes. This room is something they can grow into. Great job! This is fabulous. Lucky girls to have that bunk room. Bravo on completing a wonderful One Room Challenge! I’m having a hard time putting into words how blown away I am by this space. It’s next level perfect. You really nailed it. Every colour, print. The special touch of the painting! I’ve been waiting for your reveal and I couldn’t be more pleased. Amazing job you two. Very inspiring. Also your photos are on point! You simply nailed it. Can I move in??? Better yet, can you come design rooms for my boys? I found designing a room for a gal came naturally but my boys? They literally have posters of cars on the walls that they hung up with scotch tape. 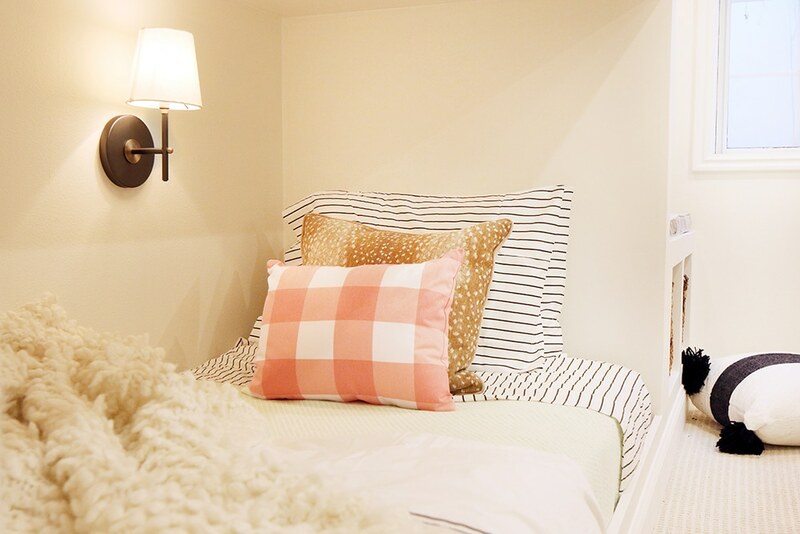 The bunks, the textiles, the wallpaper, the interesting flush mount light fixture. Your girls’ room is absolutely perfection! Amazing! You two never disappoint! what an absolutely magical space, and your story gave me chills! so happy that one day has arrived, and it’s arrived so beautifully! lucky girls you have! Absolutely precious and pretty amazing accomplishment in 6 weeks!! All that construction. But such a magical room for them to share!